What is a "Kill Step" in Food Safety? What does a “Kill Step” or "Lethality Step" mean in Food Safety? When I was first managing a commissary producing 10,000 meals per day, our engineer was always talking about the “kill step.” I never knew what he was talking about but I have since realized it is one of the most important steps in food safety. Most efforts we take in food safety are related to harmful bacteria. And most efforts are related to minimizing (but not stopping) the growth of harmful bacteria. A strategy that minimizes bacteria growth is refrigeration. Most bacteria can’t reproduce quickly in cold, but they still reproduce, albeit at a slow rate. This is the reason that perishable food doesn't last indefinitely in the fridge. Of course, without refrigeration, bacteria grows quickly at room temperature and we intuitively know this is bad (i.e.leftover chicken left out overnight). The most important thing to remember is this: if you leave food on the counter overnight and then put it back in the fridge, it won’t kill the bacteria that grew while it was sitting out, it’ll just slow down the growth process from the moment you put it back in the fridge. What's Happening in this Graph? 1. You have chicken leftovers in the fridge. There is some bacteria in the leftovers, but it is still safe to eat. You can also see that bacteria growth is slow during these periods because of the cold. 2. You accidentally leave the leftovers on the counter overnight. Eek! We can see by the steepness of the line that bacteria count is growing RAPIDLY during this time, because bacteria are happy and reproduce quickly at room temperature. 3. In the morning, you see that you left the leftovers out all night. At this point, the bacteria level is unsafe to eat, but you put them back into the fridge anyway. While this slows down the growth rate of the bacteria, there is still an unsafe amount of bacteria in the chicken. Remember the refrigeration slows down bacteria growth rates, but it does not kill existing bacteria. So why did you put it back into the fridge? (keep reading!). 4. At lunch, you throw the chicken into the microwave and nuke it for 4 minutes, remembering that you left it out all night on the counter. This, my friend, is the kill step. Cooking (in this case, chicken) to 165º F doesn't slow bacteria growth, it actually kills all of the bacteria that already grew on the chicken. At 165º only 1 in 100,000 Salmonella bacteria will survive. We call this a "Log 5" reduction because it reduces the count by 5 zeros. In effect, it "resets the clock" and makes the food safe to eat again. we see on the graph that the bacteria count plummets to almost nothing. 5. The leftovers are so goddamn hot that you went to write a blog post and forgot all about lunch for an hour. During this time, the leftovers cooled down to about room temperature, which triggered rapid bacteria growth. 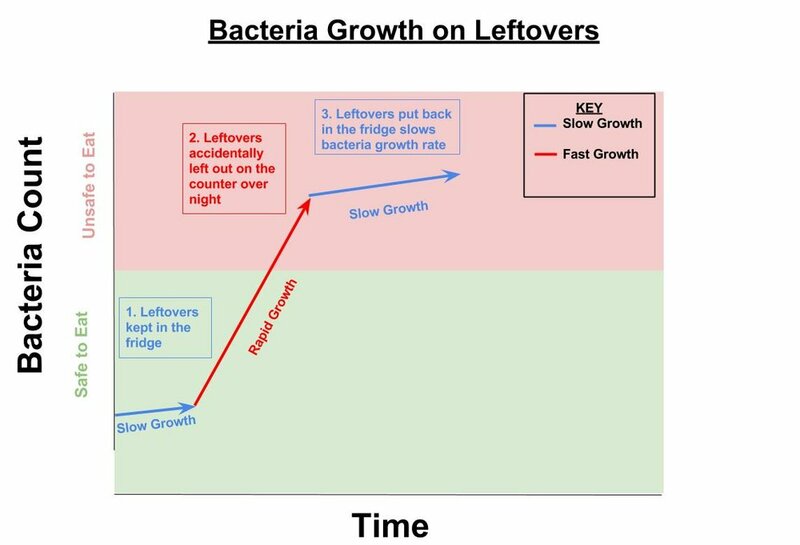 However, because you killed almost all of the salmonella bacteria in the leftovers, the bacteria count remains low, despite exponential growth rates. It's still safe to eat despite the fact that it sat out at room temperature, and this too is intuitive. 6. You remember the food and eat your (lukewarm) lunch. It tastes good and you didn't expose yourself to any food safety risk. Cooking/Reheating food ("The kill step") drastically reduces harmful levels of bacteria and makes it safe to eat. Slow bacteria growth doesn't necessarily mean the food is safe to eat (as in step #3). Putting food with unsafe levels of bacteria in the refrigerator won't kill the pre-existing bacteria. Fast bacteria growth doesn't necessarily mean food is unsafe to eat, as in Step #6. Think about your elementary school lunchbox (not refrigerated!). It's OK to have rapid bacteria growth for short amounts of time IF you're starting with a low bacteria count OR if there's a kill step after. OK So What is a Kill Step? It's important to remember that different microorganisms have different tolerances for specific treatments. Another way of saying this is: what would kill a human may not kill a cockroach (and visa versa in some cases). Freezing kills specific parasites present in raw fish, but it doesn't kill Listeria Monocytogenes, it just slows down the growth rate. Depending on the food being manufactured, multiple kill steps may be used to address different hazards in the production process. It's impossible to know the level of bacteria growth in a purchased ingredient without conducting expensive lab tests. What we can do is choose reputable suppliers, take the temperature of incoming deliveries to confirm they weren't mishandled in transport, and include a kill step in our production process. By including a kill step in our process, we are not relying on our suppliers to have a 0.00% error rate. In order to eliminate that risk, we include a kill step so we know our food is safe to deliver to customers, even if we received unsafe products from a supplier. So What's the Kill Step in My Process? Before you pick a kill step, you need to be aware of what specific microorganisms are found in the foods you produce. The good news is that specific types of harmful bacteria only exist in specific food groups, so if you make raspberry jam, you don't need to worry about bacteria that lives in shellfish. 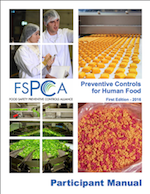 You can look up what types of bacteria exist in the food you produce in this FDA Training Manual on page 485-486. Once you know what the hazards exist in your process, you can investigate what is an appropriate kill step and implement it. Does the FDA Regulate My Food Business?